First, learn the basic of SQL server. 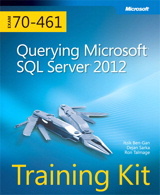 I suggest you to use this Udemy Course: Microsoft SQL Server 2012 Certification Training Exam 70-461. Although I already know 80% of the course content, I still find that it help me to gain some insight of my weak areas like transaction isolation levels, deleted and inserted table for UPDATE statement. So, if you are new to this area, this course is a good starting point. If you are very familiar with SQL Server, this could be helpful for certain area. Third, practice and practice. Not only practice the Lesson Review questions in the book, but also half of the code you see in the book to get yourself familiar with codes and details of the codes. For me, I want to focus on these topics for practicing. 1. Deduping. I read an article about six ways to dedup. My requirement for my self is to recall and practice those 6 ways in SSMS without reading that article. 2. Self Join. I want to make a employee table to practice simple self join, multiple level self join, unknown level of self join. 3. Triggers, I want to have delete trigger/check on employee table so any manager record can not be deleted; an update or insert trigger so the managing level will be smaller than five. 4. Pivot table in SQL statement and with PIVOT command. There are lots of thing need to be done before 20171214 (country neutral way of date in SQL :-)). Let me roll up my sleeves and get going.